How to make hotspot access point mode android supported on Ubuntu - As you know, most of your android device (not only android) can't connect to ad hoc hotspots, so I made this this tutorials. 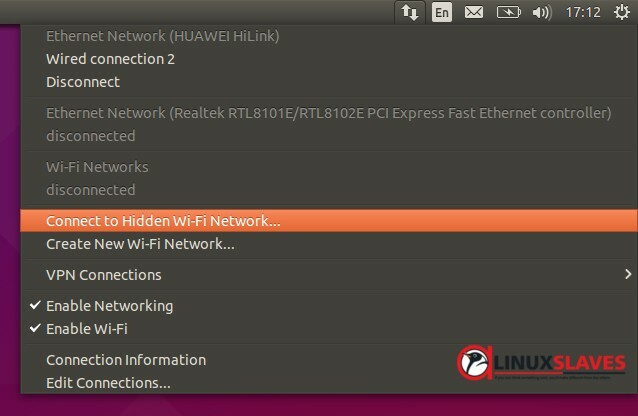 This post will tell and show you how to create wifi hotspot in Ubuntu that can share a wired internet connection with android phones. Then if you don't and looking for GUI, you can use this tutorials. Before it, make sure your wifi adapter supports infrastructure hotspots. Ok, Here we start! Step 6 - Click Network Manager on Ubuntu panel then choose "Connect to Hidden Wi-Fi network"
That's all I can write about how to make hotspot access point mode to share internet connection from Ubuntu Linux to android devices. Hope you've enjoyed reading this tutorial as much I’ve enjoyed writing it. Thanks for visiting us.